China's rapid rise as a regional political and economic power with growing global influence has significant implications for the Asia-Pacific region and the world. The United States welcomes the rise of a stable, peaceful, and prosperous China, and encourages China to participate responsibly in world affairs by taking on a greater share of the burden for the stability, resilience, and growth of the international system. The United States has done much over the last 30 years to encourage and facilitate China's national development and its integration into the international system. However, much uncertainty surrounds China's future course, particularly regarding how its expanding military power might be used. The People's Liberation Army (PLA) is pursuing comprehensive transformation from a mass army designed for protracted wars of attrition on its territory to one capable of fighting and winning short-duration, high-intensity conflicts along its periphery against high-tech adversaries - an approach that China refers to as preparing for "local wars under conditions of informatization." 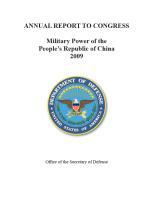 The pace and scope of China's military transformation have increased in recent years, fueled by acquisition of advanced foreign weapons, continued high rates of investment in its domestic defense and science and technology industries, and far-reaching organizational and doctrinal reforms of the armed forces. China's ability to sustain military power at a distance remains limited, but its armed forces continue to develop and field disruptive military technologies, including those for anti-access/area-denial, as well as for nuclear, space, and cyber warfare, that are changing regional military balances and that have implications beyond the Asia-Pacific region. The PLA's modernization vis-à-vis Taiwan has continued over the past year, including its build-up of short-range missiles opposite the island. In the near-term, China's armed forces are rapidly developing coercive capabilities for the purpose of deterring Taiwan's pursuit of de jure independence. These same capabilities could in the future be used to pressure Taiwan toward a settlement of the cross-Strait dispute on Beijing's terms while simultaneously attempting to deter, delay, or deny any possible U.S. support for the island in case of conflict. This modernization and the threat to Taiwan continue despite significant reduction in cross-Strait tension over the last year since Taiwan elected a new president. The PLA is also developing longer range capabilities that have implications beyond Taiwan. Some of these capabilities have allowed it to contribute cooperatively to the international community's responsibilities in areas such as peacekeeping, humanitarian assistance and disaster relief, and counter-piracy. However, some of these capabilities, as well as other, more disruptive ones, could allow China to project power to ensure access to resources or enforce claims to disputed territories. Beijing publicly asserts that China's military modernization is "purely defensive in nature," and aimed solely at protecting China's security and interests. Over the past several years, China has begun a new phase of military development by beginning to articulate roles and missions for the PLA that go beyond China's immediate territorial interests, but has left unclear to the international community the purposes and objectives of the PLA's evolving doctrine and capabilities. Moreover, China continues to promulgate incomplete defense expenditure figures and engage in actions that appear inconsistent with its declaratory policies. The limited transparency in China's military and security affairs poses risks to stability by creating uncertainty and increasing the potential for misunderstanding and miscalculation. The United States continues to work with our allies and friends in the region to monitor these developments and adjust our policies accordingly.